Is Chong’s Cheating Expose Relating to Marcos-Robredo Protest Not Enough to Make him a Target? Santillan is the aide of Chong, a former Biliran representative now running for senator. PAO forensics team chief Dr. Erwin Erfe said the body of Richard Santillan, who was a bodyguard of former Biliran Rep. Glenn Chong, sustained 63 wounds in different parts of the body. A resolution directs the committee on public order and dangerous drugs to conduct an investigation in aid of legislation on the brutal killing of Richard Santillan. Its goal is to craft more effective measures to ensure public order and safety during the election period. Lacson still reiterates that he does not buy the scenario that the police would go after Santillan and not Chong if he was the real target. Meanwhile, Chief Supt. Edward Carranza, PNP-Region IV-commander emphasizes that there was no rubout as Chong claimed. He maintains that Santillan was driving the Fortuner together with members of the Highway Boys Group. They were engaged lawmen in a gunbattle. Although, the evidence proves otherwise. Supt. Joseph Arguelles of Police Regional Office 4-A denies the allegations of Chong that Santillan was kidnapped, tortured, and killed. He testifies before the Senate committee on public order and dangerous drugs hearing chaired by Senator Panfilo Lacson that the evidence shows that there was a shootout. He said that Santillan was able to fire shots while outside the vehicle where he eventually died from gunshot wounds. All these statements from the PNP do not match the forensic findings of the PAO. In fact, the dead victim did not have a gun. According to Carpio of the PNP insists that the condition of Santillan’s toenail was due to a grazed gunshot wound. He said that the wound correlates with the bullet holes in the vehicle. As for the hematoma on Santillan’s body, he said this was also caused by a gunshot. The slug causes the hematoma before exiting the body, he added. The open wound or abrasion on Santillan’s body was not a sign of torture. It was caused by fragments from the slug, he argued. Recap and highlights of the lies and claims of the police involved in the crime were not consistent with the evidence. This is the protest of Chong. 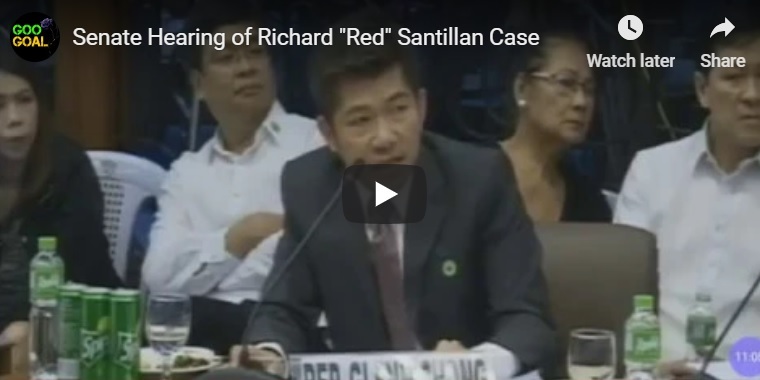 Richard “Red” Santillan is clean according to the policemen themselves. Dr. Carpio, a medico-legal doctor said that there was no sign that Santillan receives a blow on his head. However, PAO forensics did a thorough examination and discovered a hematoma. Besides, Richard Santillan was found negative on paraffin test. Traces of gun powder nitrates were not found in his body and clothes. Next post: Who can Block Imee Marcos become the Top Senator in the 2019 Elections?